Place the 5 sockets on the board playing special attention to the orientation indicated on the board and sockets by the notches (highlighted red). It’s best practise to put the chips in at the end of the build. Don’t panic, if you solder a socket in backwards, it will still work. You just have to be sure the chips themselves are oriented correctly. 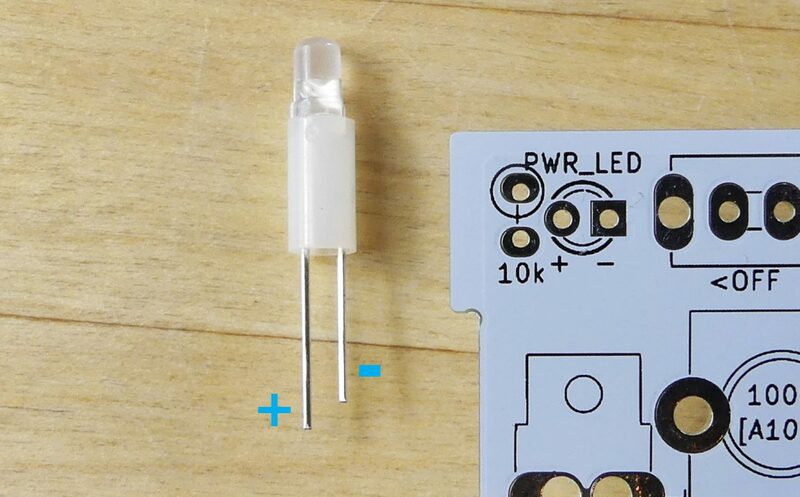 Thread the spacers onto both of the 3mm LEDs (Light Emitting Diode) and push them into the PCB. Ensure the long leg (the anode) goes in the + hole. Make sure the spacer and led are mounted flush with the PCB, there should be no gap or room for movement from the spacer. 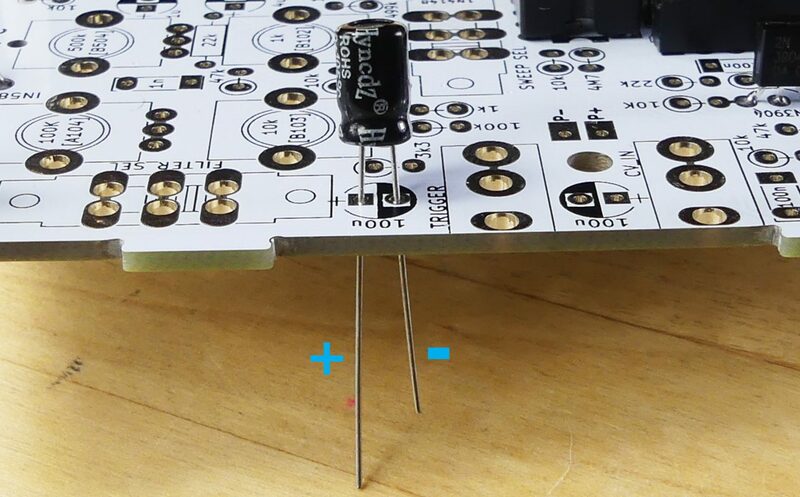 Next up, the electrolytic capacitors – check their values match the markings on the board (100uF, 10uF, 4.7uF and 1uF) and the long leg (+) goes in the square pad. 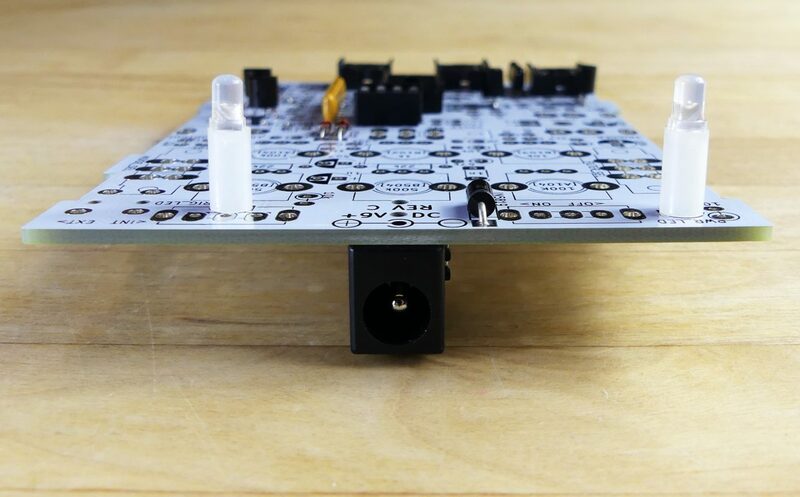 The white line on the capacitor will sit on the same side as the filled silkscreen. *Although sometimes they work badly for a little while and then randomly fail. 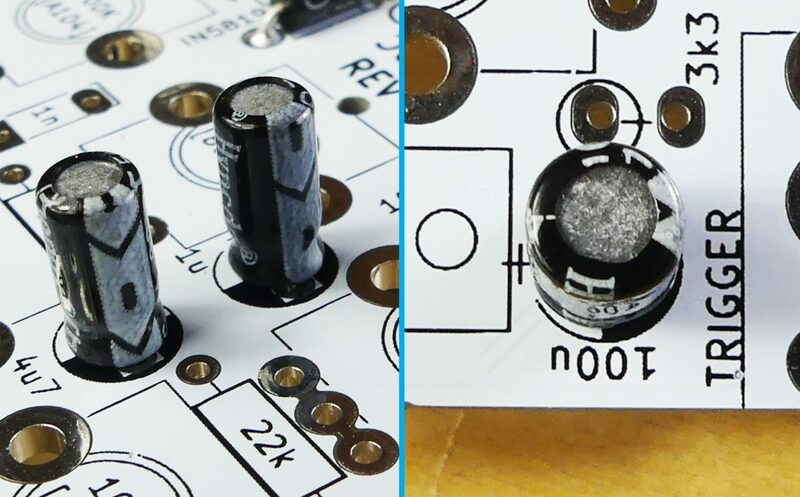 A few capacitors placed as outlined above, nicely butted up to the PCB. All polarised components have now been placed. 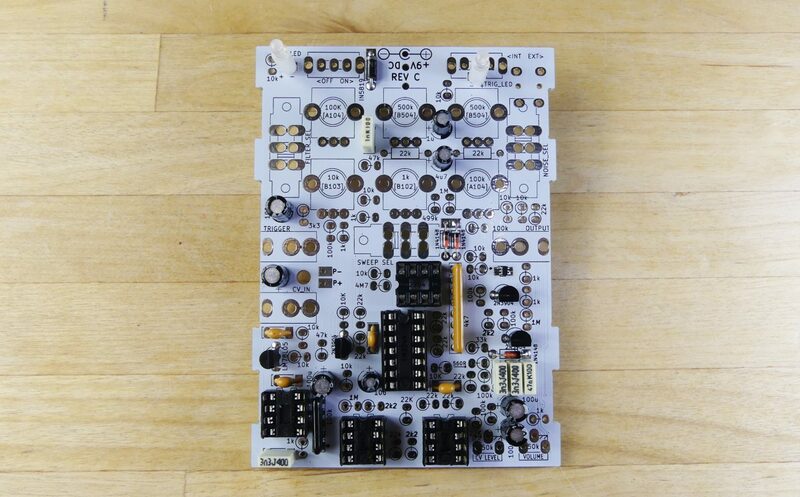 Find the four 100n ceramic capacitors marked on the board. These are a deep yellow color and all sit near each other on the lower half. 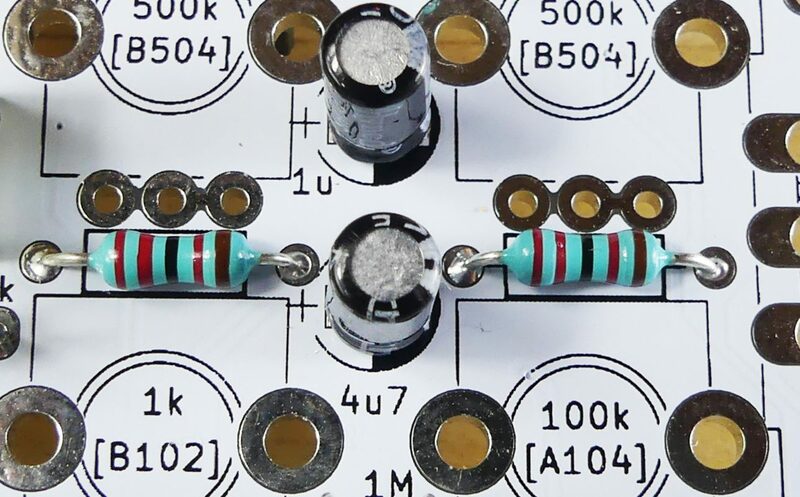 Insert the five box capacitors into their marked slots – 1n, 3n3 and 47n. 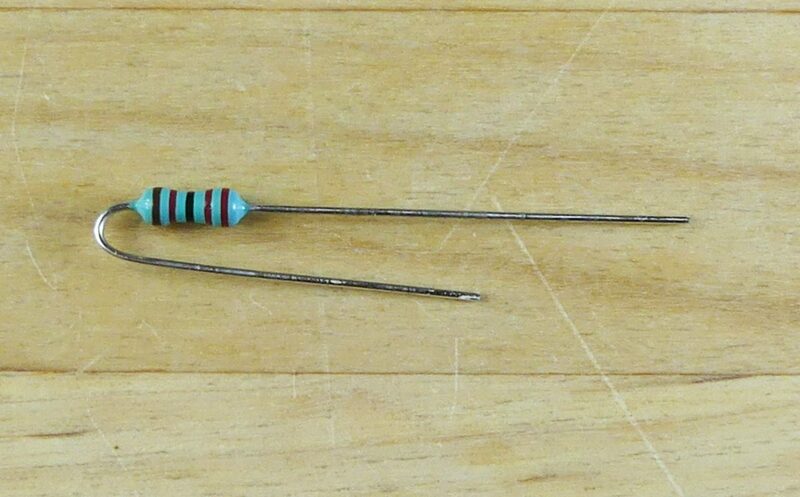 Two resistors that are especially easy to mix up are 3k3 & 33k. Make use of the interactive map below to double check and locate values. Place the two 22k resistors below where the the 500k potentiometers will go. These are the only two resistors which will be lying flat on the board. 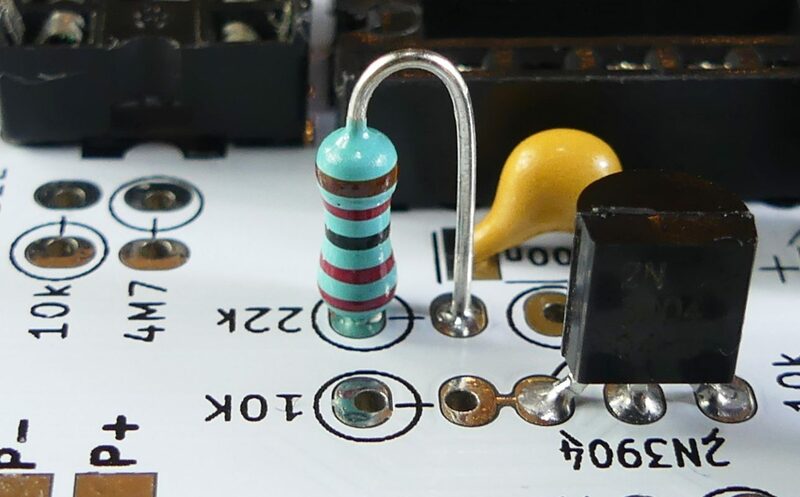 The other resistors will be horizontally mounted, so bend the wire over as shown in the picture. 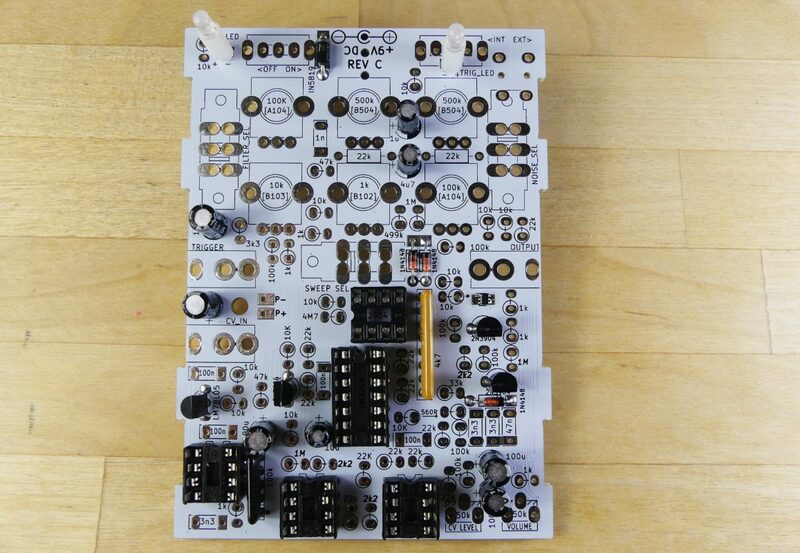 Make sure they are nice and snug to the board like the other components we’ve placed so far. A nicely seated resistor with the body in the silkscreen circle, not critical most of the time but might be useful in fault finding later on. 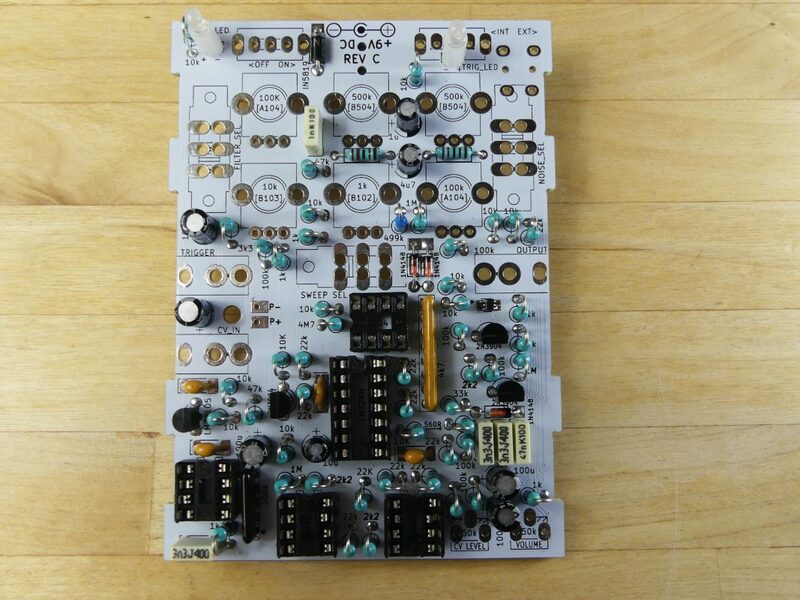 Use the interactive resistor map below, silkscreen or both to aid in placing the resistors. 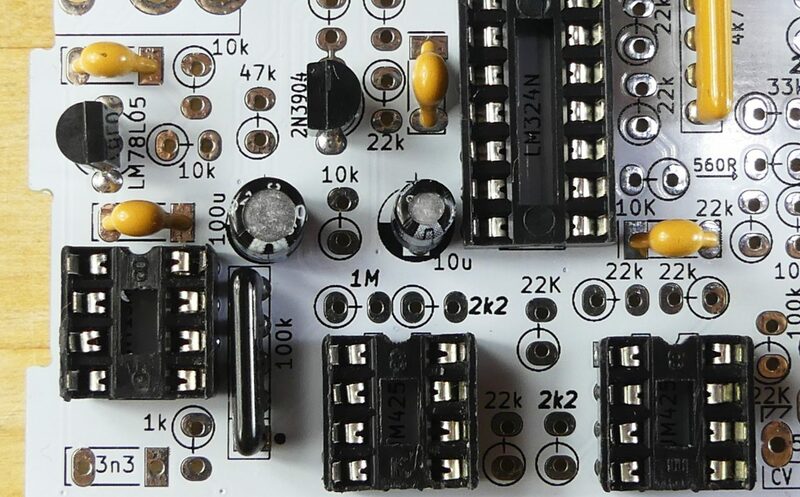 Mouse over the table or picture to quickly locate your resistor value of choice. Time for a celebratory cup of tea*, maybe take a break? Or just crack on, there’s work to do!